The all new Moto DX Handshields offer a rubber flexible edge that provides 20% more coverage than the traditional Stealth, giving you just that little bit of extra protection from debris or elements. These shields also incorporate a mount plate on the front that gives you the ability to mount them to the brackets in an upper or lower position to fit your specific application best. High Quality injection molded composite shields. Slim, low profile handshield design. Rotating bolt plate allows brackets to be mounted above or below levers. Fits most applications from mini bikes to full size bikes and quads. CNC Machined 6061 T-6 Billet Aluminum Alloy Brackets. Includes: Shields, Brackets and Hardware. definitely more of a twig and light roost guard, but all thing considered they do their job and keep the stingers at bay. like the new swing away feature, don't like the graffics that don't stick and fell off or peeled back the first ride. good fit, cool product. I had a few extra acerbis stickers I put on them after the cycra stickers fell off. I bought these gaurds strictly for hand protection against the person in front of me kicking up rocks and other hard objects so i got exactly what i had expected. They protect your hands great but if you crash do not expect them to stay perfect. After one fall they are now stress cracked at the mounts but I still do like them and they fit great and look better. If youneed to use the spacers between the bar clamps, the bolt holes did not match up! Idon't like products that you have to modify. Poor manufacturing! 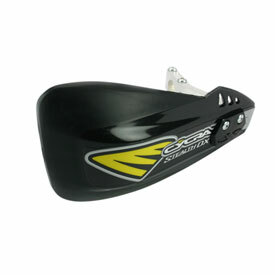 If you want High quality hand guards for your motorcycle,then these are for you. I have had these hand guards for 5 years now. They have taken a beating and still function like they are new. I like the fact that they are small enough not to get caught up when snaking thru the tight trees and big enough to protect you from roost and branches. Like was mentioned before, keep the mounts loose enough to flex if you wreck and that will keep them from breaking. They are decent roost deflectors and get that job done well enough. These have been on my bike for over 2 years and held up very well. They've done so well I ordered another set in a different color to update the graphics and plastics on the old bike. Great value and good coverage for roost or to keep the cold wind off your hands. I tried both the MX and DX models which are nearly the same, one is just a bit more coverage. They work fine against the wind and minor branches, roost etc. Keep the mounts loose so they will not snap in case you go over. Probably the simplest mounting handguards I've every installed. They have served their purpose as far as roost and small branches are concerned. Perfect for motocross tracks. Good for deflecting roost. Fit my YZ250f fairly well. I would not ride with them off road. They are too flexible when it comes to tree branches etc. I rather use a wrap around style guard for the outdoors! Best Handguards I have ever owned. The quality and looks are the best On the market. will the mounts fit on 1/18'' bars?????????? are the brackets plastic or metal? BEST ANSWER: The brackets are metal. Ok for motocross but there are better/stronger options for enduro/harescramble that provide more end coverage. Any wrap around guard will work better in the woods. The brackets are metal (Aluminum Alloy).